Introducing the world's first true golf hybrid! Brought to you by GoCaddy International Ltd.
Our unique new product, The GoCaddy, represents the dawn of advancement in golf transportation technology. 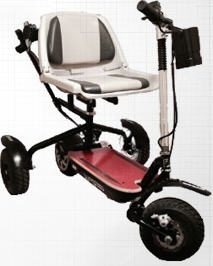 In partnership with The Go-Ped Group of Companies, manufacturers of the popular Go-Ped electric scooter, we are proud to introduce the most versatile personal golf cart system ever designed and proudly "Made in the U.S.A."
Once we secured a comprehensive U.S. Utility Patent, the high quality Go-Ped scooter was a natural fit for the single-rider scooter type golf cart. Using lightweight and durable materials such as carbon fibre and aircraft aluminum, the GoCaddy was born. GoCaddy International Ltd. is headquartered in Calgary, Alberta, Canada and the product manufacturing facility is located in Minden, Nevada, USA. The mountainous regions in which we are located is an excellent proving ground and we know you'll be impressed by the performance of our entire product line. Thanks for your interest in the GoCaddy and we look forward to seeing you on the course!